Heavenly Father, your heart is pure and filled with grace, mercy and love. Your intentions are always for our good and your ways are never selfish. You search each of our hearts Lord and examine all of our secret motives (Jer 17:10) — you know that our hearts are sinful and our motives are filled with pride, selfishness, anger, envy and all kinds of deceitful things (Jer 17:10). 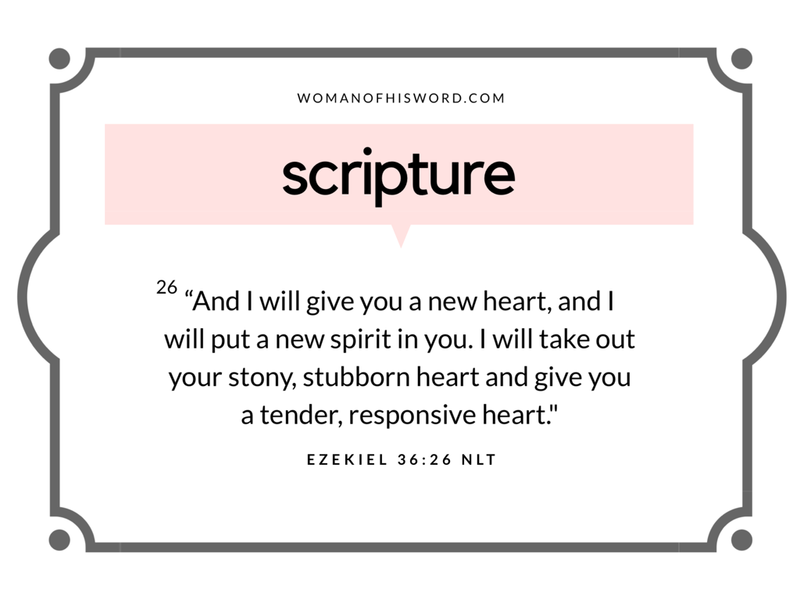 I ask that you give me a new heart and a new spirit, Lord. Forgive me for all of the displeasing things that you discover hidden within; things that I may be blinded to. I pray that you would point those things out to me; give me wisdom to discern it and strength to get rid of it. Remove my stony, stubborn heart — give me a heart that is tender, forgiving, loving, patient and kind. Help me to guard my heart because I know everything flows from it (Matthew 12:34). I pray for those whose hearts are stony and stubborn. I pray Father, you would go to work on shaving down their rough edges and breaking down the barriers they’ve created so can give them a new heart filled with peace and joy. Please go before me this week Lord, help me to walk in your ways and to be an example of your goodness and your beautiful heart. I pray in Jesus’ name, Amen. Thank you for visiting, God bless.